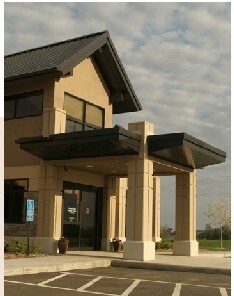 MMY has designed multiple clinics for the Northfield Hospital. These clinics use one­ story exterior bearing walls and interior steel columns and beams for the roof support. The roof structure was designed to carry large roof top units, hanging exam lights and x-ray equipment and significant snow drifting caused by roof top unit screening. The front entrance canopy and popped-up clerestory windows require steel framing and pre-manufactured roof trusses to create the higher gable roof. For efficiency, the lateral restraining system for this building employs exterior shear walls sheathed in plywood and with pre-manufactured hold-downs.